When 13-year-old Luis Cordoba gave up soccer for one of Santiago's handful of Little League baseball teams last year, he didn't know it would land him a better education. Cordoba's story is a rare one in Chile. Soccer is the national sport, baseball is virtually unknown, and sports scholarships are almost unheard of in the country. But thanks to help from the United States Embassy, a Little League program here is now in its fifth season. Sixteen teams currently play inside the league consisting of over two hundred children. Both boys and girls play together, and the league is divided into three age ranges (9 to 11, 12 to 14, and 15 to 16). And it's more than a game. The program joins schools and municipalities from all sectors of society. The rich and poor play together, and the sport fosters a cultural exchange between the English-speaking expatriate kids who play with their local counterparts. "They saw me play in Cerro Navia and gave me a scholarship after I won the championship there," said Cordoba while taking a break from an after-school game. "My new school is much better than my old one, and my parents were really happy about it." 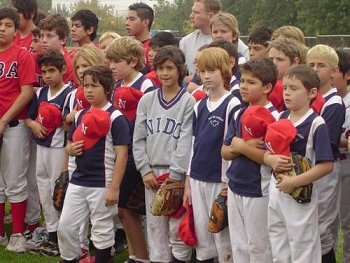 INBA (Internado Nacional Barros Arana) is one of several schools in Santiago that have created baseball programs within the new Little League, and school director Juan Yañez said the program s growing even though soccer, basketball, and swimming are still the students' favorite sports. "There are four students here who we gave scholarships to reinforce the baseball program, and the results have been very good," said Yañez. "They come from very modest families, and we think this will change their lives. A very high percentage of our students go on to college." Driving the Little League effort is the American embassy in Santiago. In 2005, United States Ambassador Craig Kelly, an avid baseball fan and California native, and his wife Kim embarked on a campaign to bring baseball to their host country and were instrumental in setting up the league. Major League Baseball International has actively supported the program, and famous Dominican pitcher Elias Sosa was in Santiago for two weeks in mid-April holding clinics with local youth. Kelly joined Sosa At a baseball clinic at INBA last week, and his face lit up as he played ball with the eager students. "This is what diplomacy is all about," Kelly said. "Baseball is helping us draw young people of Chile and the United States closer together." Little League president Jorge Luis Varela agreed that the program has been a great bridge between rich and poor communities, but added it was sometimes a challenge. All games are currently played in a central Santiago stadium, and it is hard to finance transportation to bring in players from poorer outskirts of the city. "We call the league a holistic program," said Varela. "It's had, so far, a fantastic cultural component and it is building bridges. We don't accept that any child who wants to play can't." Speaking to over 100 Chilean youth bearing balls and bats, Sosa promoted the higher virtues of baseball. "Baseball is not a violent sport," he said. "It's a sport that creates communities and fosters friendships. Don't worry if you make mistakes. Mistakes are part of baseball." Sosa added that he was anxious to see Chile send a player to the Major Leagues and said several of the older players he saw in Chile had the potential to make it with a little help and a lot of effort. Many of the kids already seem to be learning Sosa's lessons. "I was interested in baseball because I didn't know anything about it," said 15-year-old Sebastian Donaire, who plays right field. "We grow up knowing all the rules of soccer, but I didn't know anything about baseball. A lot of my friends make fun of me because they say it's not a Chilean sport, but I like it." Bruno Hiche, an 11-year-old INBA student who plays second base, was extraordinarily philosophic for his age. "I think it's a wonderful sport," he said. "If you mess up one day, you just have to keep going. Tomorrow you can do it better. Making mistakes is not bad."